When it comes to your smile, you deserve the best! Dr. David Scharf specializes in dental implants and can provide you with permanent solutions for teeth replacement. Patients with dentures, or several missing teeth can benefit from All On 4 Dental Implants in Long Island. Modern designs and technology has provided our team with everything needed to bring the best dental science to our patients. What are the options and differences for All On 4 Dental Implants? Dental implants can range in price due to bone density and other treatments required to prepare the area for permanent dental implants. The standard All On 4 process will include four dental implants surgically implanted into the jaw bone, and an acrylic denture will then be placed on the gums using a titanium frame to hold it in place. It is difficult to offer pricing over the phone as the costs change based on your current oral health situation. Some people find that they need bone grafting prior to implant placement as the jawbone is simply not strong enough to withstand the amount of pressure placed on the jaw when there is chewing action and the breakdown of foods. 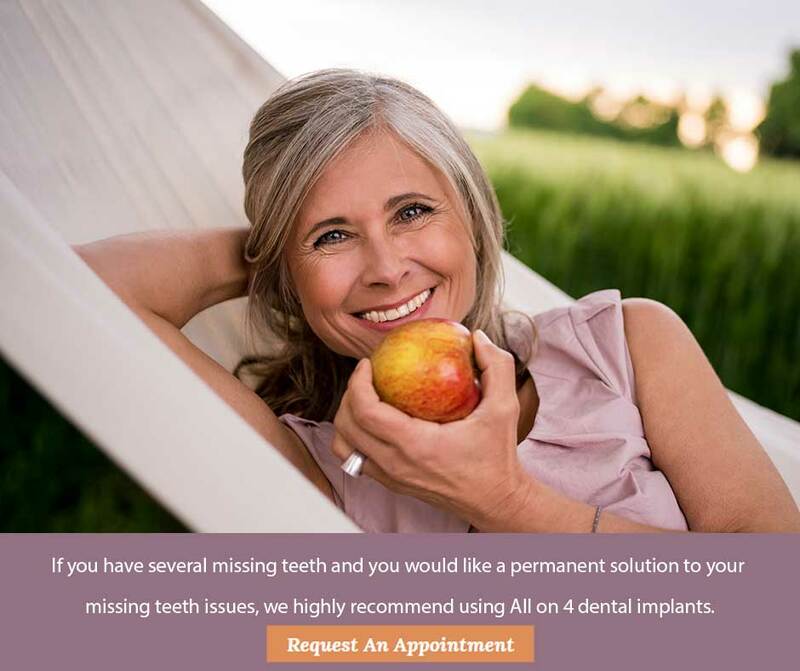 If you have several missing teeth and you would like a permanent solution to your missing teeth issues, we highly recommend using All On 4 Dental Implants in Long Island. We specialize in the use of multiple materials to ensure the implant will be strong. While titanium is the preferred choice, it is not the only option. We do have some patients that are allergic to titanium, or others that simply find the titanium will not bond with their jawbone. Zirconia and CrCo are other materials we can use as a base prior to attaching the porcelain crowns to the base. Again, until we know whether your oral health history will be able to work with the desired metal, it is difficult to give a ballpark figure on costs. We need to see you first and take x-rays to determine bone density and improve the successful outcome of the procedure. Why All on 4 Dental Implants? Dental implants require technical work to properly insert the posts into the jawbone. We need to then watch the area to ensure it is bonding and healing correctly. Our staff has placed thousands of dental implants, with most patients receiving successful outcomes for their All On 4 Dental Implant treatment. We use a technique known as angling to prevent patients from needing a sinus graft. We can place a bridge 24 hours after surgery, allowing our patients to have a complete set of teeth once again. Patients with dental implants will see improvements in their self-esteem along with the dental benefits of improved chewing, speaking, and eating. Patients no longer need to constantly adjust the teeth for comfort and aesthetic purposes. Dental implants function just like your regular teeth. You will need to brush and floss them normally, along with rinsing them daily to ensure you are removing bacteria and preventing it from infecting the gum tissue. Caring for your gums is essential to long-term success of dental implants as the gum tissue is responsible for helping to hold the all on 4 implants in the proper position. You will want to come in for annual visits to our office in Long Island to ensure your overall bone health is strong and the implant is functioning correctly. Did you know that 74% Americans are self-conscious about their smiles? If you are concerned about an unattractive smile and feel that it is having an impact on your daily lifestyle, it’s time to consider options for your dental health. All On 4 Dental Implants can be done promptly and you can see a difference within 24 hours as we can place the prosthetic teeth on the implant bridge in a day. Same-day improvements to your smile. Eating whatever you like without concerns of teeth falling out. Improve the structure of your face. When teeth are removed, the skin can start to have a “sunken in” appearance as there is no internal structure for the cheeks to press against. Have a permanent solution for your missing teeth problems. Easy to maintain and have a complete, impressive smile once again. Contact us today if you would like to schedule a consultation to learn more about All On 4 Dental Implants and if this is the best procedure for your oral health goals.